then heading back to dock... not today. That lone fish was the only thing that took my line the entire morning. Emily on the other hand out-fished all of us by catching three large ones that dwarfed mine. Brendan was even able to land one just before we had to turn around and head back. Karen was just along for the ride. I’m not sure why the fish weren’t biting and Captain Steve seemed equally perplexed. The sea was eerily calm without any significant swells so maybe all the fish were just asleep! the process. On a few occassions several of the other young kids joined in to help but it was mostly me. One pot that we pulled in had an enormous crab in it that I definitely claimed for my own (crab in the photo here). Two of the cocky young kids kept saying that they claimed it and I simply shrugged them off. I helped the mate sort through the females and the males throwing back the females and those that were too small to keep (less than 4” across the widest part of the shell). It was the closest I’ll probably come to being a true crab fisherman! 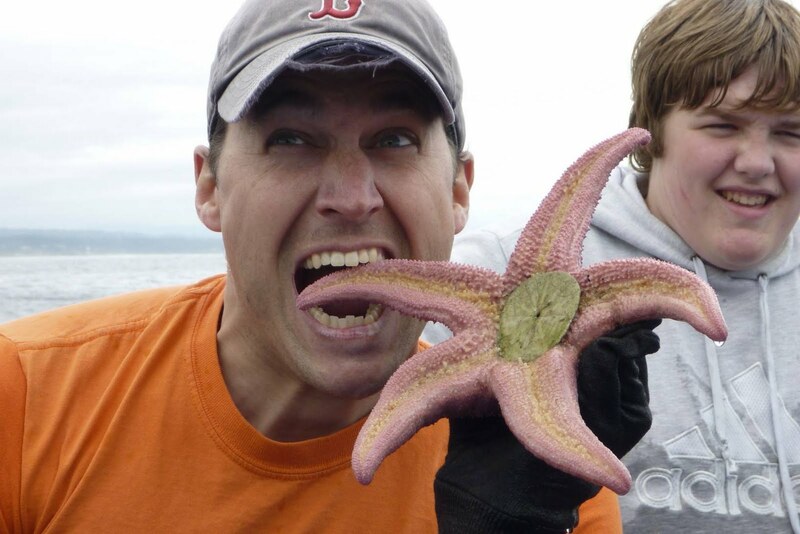 One pot that we pulled in had a huge starfish in it that ironically was captured in the process of eating a sand dollar! seen that done before... check out the video here. I asked him why people don’t eat that part of the crab and he offered me the shell full of juice which I happily sucked down to the disgust of those around me. I joked with him saying that I’d be bck to visit him at the docks later this summer for some more! Emily and I ended up with about 14 crabs. Considereing that they cost about $15-$20 at the store we did pretty well despite only coming home with 4 fish.